During a morning with frost a few weeks ago, the silvery-tipped leaves of this Saxifraga paniculata stood out among the many other beautiful specimens in UBC Botanical Garden’s Alpine Garden. Daniel has been patiently teaching me to use the BPotD camera, and despite my best efforts, I was not quite able to capture the glow of the morning sun playing across the surface of the saxifrage’s rosettes. This photo comes fairly close; for the rest, you’ll need to use your imagination. Saxifraga paniculata, also known as lime-encrusted saxifrage and white-alpine saxifrage, is a circumboreal species that is found in calcareous boreal, subalpine, and alpine habitats in North America, Europe, Scandinavia, Iceland, and Greenland. This species’ common name is a result of lime-secreting pores on the leaf edges, which give the toothed leaves a silvery or ‘encrusted’ appearance. What I had at first thought to be the work of a particularly hard frost was actually the combination of frost and secreted lime, both of which contributed to making this plant literally glow against the shaded ground. Encrusted saxifrage is a stoloniferous perennial that is extremely hardy. Its stiff, leathery leaves form 3cm tall rosettes that close as they become desiccated, with the outer leaves acting as an evaporative and solar shield for the younger leaves in the centre of the rosette. During times of extreme drought, these outer leaves dry out completely, but the plant itself is protected and survives. The species is also able to survive a short growing season and long periods of cold-induced photoinhibition (meaning that it is so cold that very little photosynthetic activity can occur). On top of having to survive extreme cold, drought, and insolation, Saxifraga paniculata must contend with an irregular supply of pollinators. However, it can both reproduce vegetatively through its stolons and self-pollinate. The perfect flowers of lime-encrusted saxifrage are quite beautiful. I came across this species at the wrong time of year to capture the white, five petaled flowers, but thankfully these have been amply photographed by others. The Acta Plantorum website has many photos that show the curious purple-dotted white petals, as well as some images of lime-encrusted saxifrage growing in its alpine habitat. “literally glow”? You mean it is phosphorescent? I would like website where I can identify some flowers which I saw on the edge of the Tibetan plateau in Sichuan. One was a yellow poppy which now and again threw a red and also a purple variety. 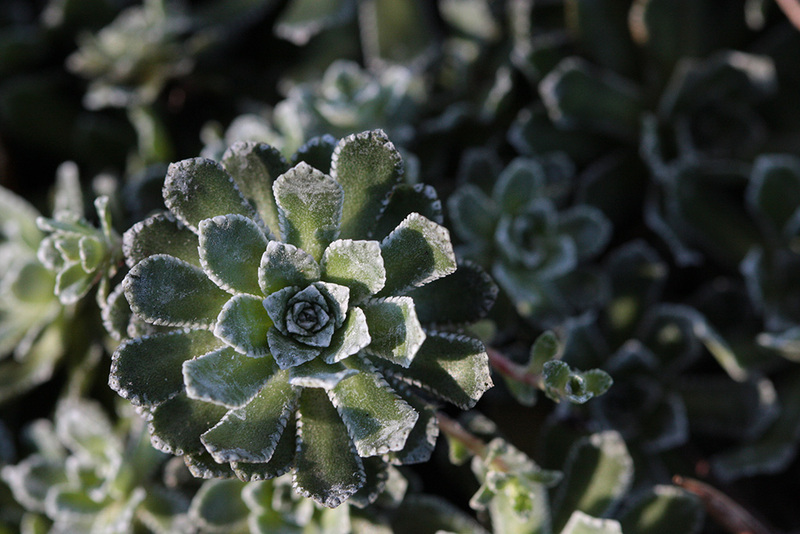 Tamara, I know you feel like a novice with the camera, but you did a fine job of capturing the frost on this saxifrage. Great photography and a fine write-up. Thanks! Is the lime calcium carbonate, pure or mixed with magnesium carbonate, or is it something else? Why are some of the Saxifraga paniculata on the Acta Plantorum website not spotted? Scratch the word “literally”. It is not phosphorescent! But this saxifrage does reflect the sunlight in a rather stunning manner. And thanks all, for the photography complements. I live in Colorado Springs, Co at 6,500 feet and have grown Saxifrage paniculata for many years in troughs in part shade. Would anyone have a suggestion of a good plant Identification reference for unusual succulents found in remote desert regions of northern Namibia in southern Africa? Rita, Biodiversity of the Hengduan Mountains, but you do need to be somewhat familiar with how to search it (and be prepared to do a lot of clicking). For example, here is the list of members of the poppy family: Papaveraceae. Ann, a number of resources out there re: succulents and Namibia, but none that I could locate that have a systematic approach. Ann Young, you should check on facebook. The specialist plant groups there are astounding, with so many true experts. I think you might find what you’re looking for there. An excellent write up, Tamara! Thank you, Daniel, I found my poppy. now I have to decide what all the others are so that I can find them !